For many people, there are few bonds in this world as strong as those between a human and non-human animal. There are myriad reasons we bring animals into our lives: to keep us from being lonely, to have someone to pal around with, to nurture one who has been abused and/or abandoned, or even to save a life that’s about to be destroyed. The attachment that forms between people and animals is often so profound that we are shaken to the core by all the feelings that will inevitably arise when they are no longer with us. And the questions will follow. Is what I’m feeling normal? Who should I talk to? How can I cope? The most important thing to remember is that losing an animal will stir up the same array of emotions and thoughts as if you had lost a human family member or friend. Feelings of sadness, anger, resentment, loneliness, guilt, and hopelessness are all common. And they will be present whether you had to euthanize your animal companion, give him up, or cope with her being lost or stolen. Speaking about your loss will help you move through the mourning process, but eventually, you will get to the point where you’re ready for closure. But let me be clear about this — closure does not mean forgetting about the life you have shared with your pal. Rather, it brings you to a place where you’re able to reflect upon the good times but still move forward with your life. Memorializing your animal family member is a good way to accomplish this. Consider having a dinner with friends where you all reminisce about the animals that have been in your lives. Assembling a photo album with pictures of your animal companion is another option. You could even hold a memorial service or make a donation to an animal charity in your companion’s name. Do what feels right, for you. There may come a time, down the road, when you consider bringing home a new animal family member. It’s important that you don’t allow yourself to feel pressured into doing this; the time must be right for you. One animal can never replace another, but if you feel you still have love in your heart to nurture another being, remember there are plenty out there who would be happy to receive that nurturing! If after a reasonable amount of time you find that you are still having difficulty functioning in your daily life, that you’ve cut yourself off from loved ones, and that you no longer enjoy the activities you used to, it might be time to consider professional help. 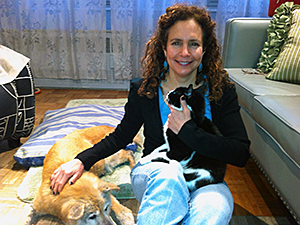 Finding a therapist who specializes in animal bereavement would be a good place to start.